They display memories and family and happiness. You can arrange them in all shapes and sizes. They can be crazy cheap to put together. There is a style out there for everyone. Right now, I’m in the midst of getting a ton of other pictures up in our house. Every time we get more pictures up, it increases my happiness and sense of accomplishment by indescribable amounts. It also gets easier to do each time, as Ben and I now have a system for getting our photos up. A few weeks ago, we got pictures up in Kaylia’s new room, and I took a few pictures of the process (which is crazy – taking pictures of putting up pictures??! ), just to share with you all, in case there’s anyone out there who’s secretly wanting to get pictures up, but never getting around to it because it feels like a big job. I love Pinterest. 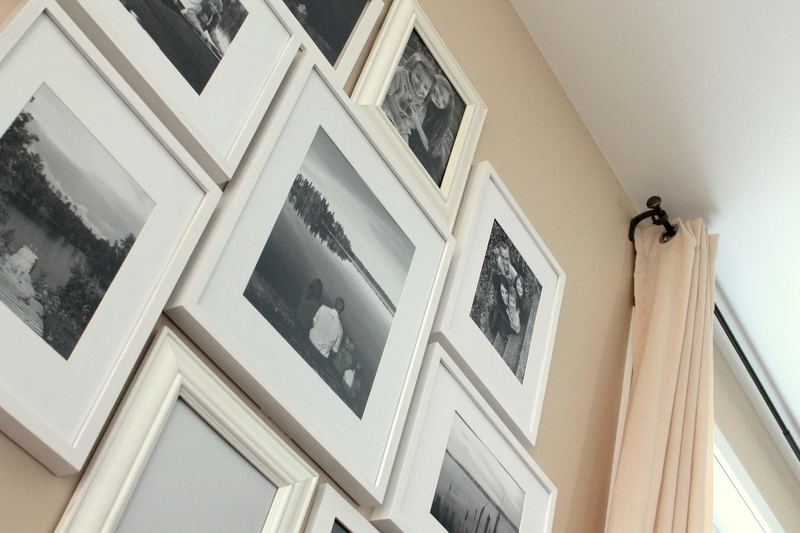 There are millions of ideas for how to get photos up on your walls. Check out my board of photo wall inspiration if you need ideas! Once I find an idea of what I want, I collect every spare frame I can find in the house, and get to work. I lay them out in a number of different formations, taking pictures of each one. This step is not mandatory, but I have found it to be so helpful every time. I’ve traced my design onto brown packing paper or wax paper, or made paper cut-outs of all the frames I intend to use, and put these up on the wall to see how it looks. For many frames in one arrangement, I prefer packing paper, but for just two or three frames, I cut out the shapes. This time, I didn’t have any packing paper in the house. 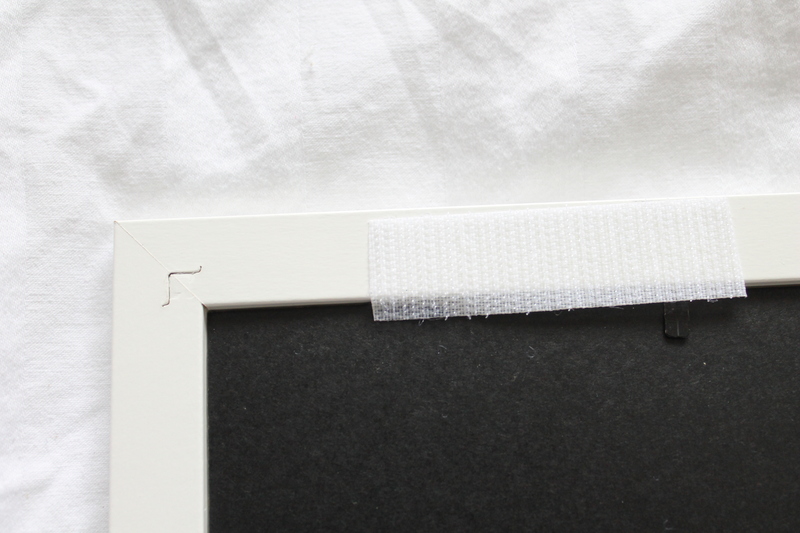 Get your frames fastened to the wall. We use a level, a pencil to make markings, and our beloved velcro. We start from the bottom corner, or from the center of the arrangement of frames, depending on what kind of design it is. Once we have a frame attached to the wall, we use the level to draw straight lines for placement, line up the frame, and stick it on. It is SO MUCH easier than hanging pictures from screws. Stand back and enjoy the finished product! It took us under an hour to get everything up. That might still sound kinda long, but it’s totally worth it! 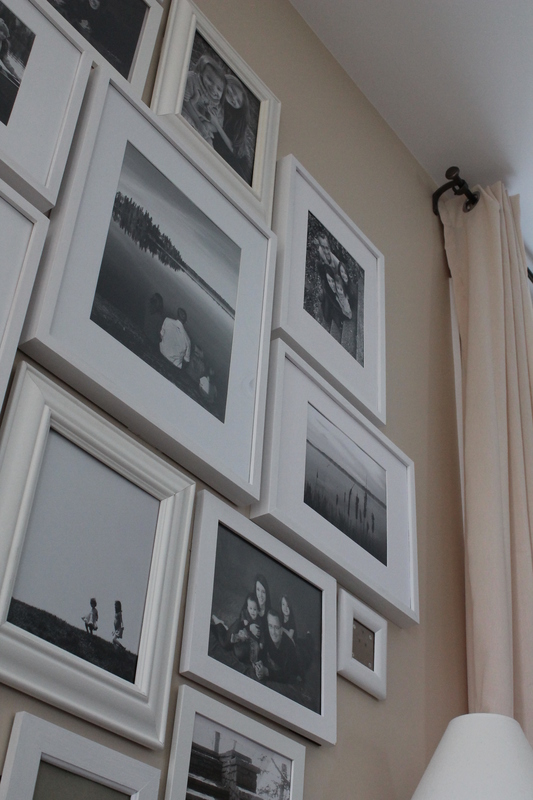 What part of the picture-hanging process holds you back the most? Any tips for getting past it? I wrote this post recently about why I love having pictures up on the wall, so I don’t have anything new to say about that. However, I felt I needed to add “photo galleries” to my list of favorites, because I have learned to love them in the last few months, and feel that they take picture-hanging to a whole new level. It’s my favorite wall in the house. 1) They tell so many stories, all at one time. I love having room for displaying many of our favorite photos, from different stages of our family’s past. 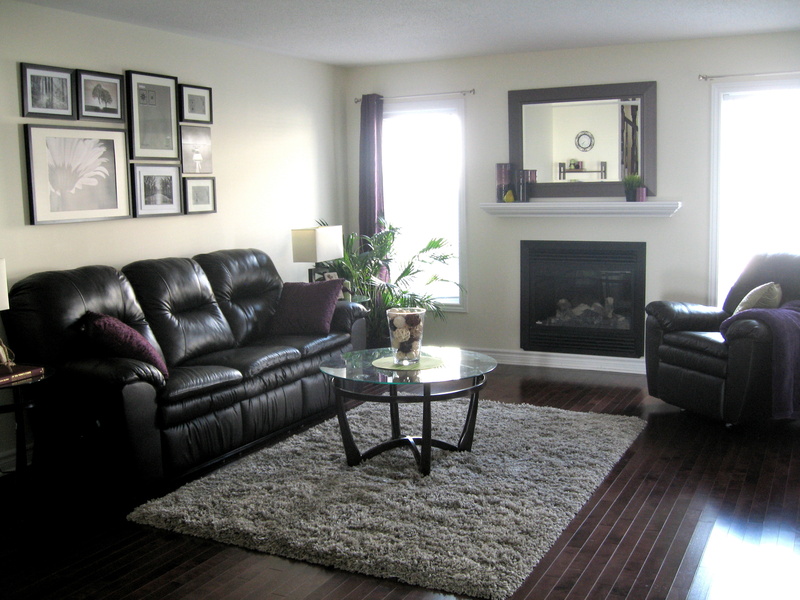 2) It’s a cheap way to fill up a large space in your home. 3) Anything goes. 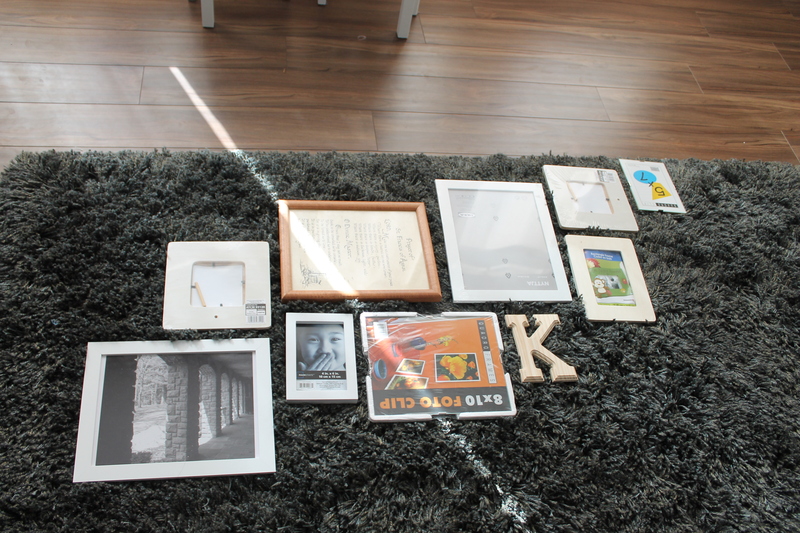 There are countless ways to arrange your frames, so you can hang them in a way to fit your spot, using whatever number of frames you choose, in a neat and orderly fashion, or as random as you want. There’s something for everyone. Pinterest is my favorite place to look for photo gallery inspiration. 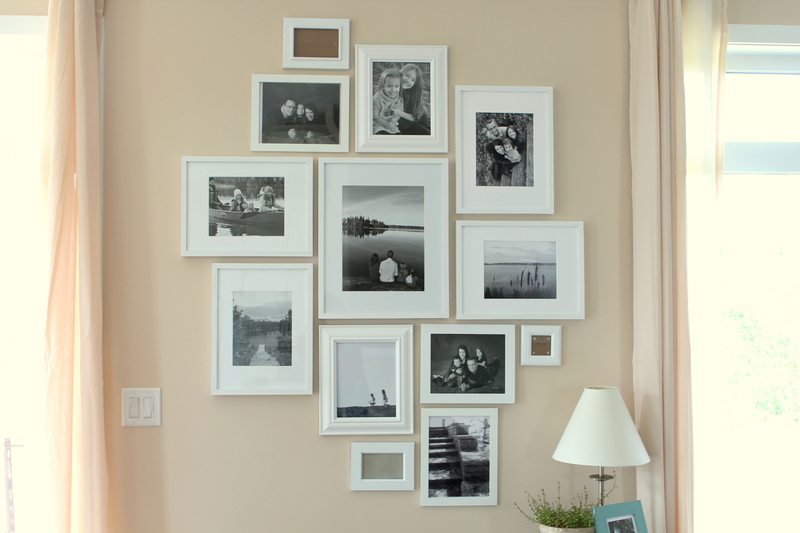 Oh, you could spend hours looking at beautiful ideas for how to hang your pictures. A photo gallery is a fair amount of work, but it is totally worth it in the end. Do you hang pictures up in your home? Any large spaces just begging for a photo gallery?! Because Ben is amazing, we have a new photo gallery up at our house. Hmm, that makes it sound like he was the one busily arranging frames and choosing pictures….His amazingness was actually shown in the fact that he humored me for three hours of intense measuring, marking, leveling and hanging up pictures, which is not something he would normally choose to do in his free time. But I am sooo loving having some pictures up on our walls. And I am so thankful for an understanding husband who knew how badly his girls needed some help in feeling “at home”. You could say we were just filling up blank space on our new walls. But pictures have always been far more than that to me. Pictures on the walls are the fastest way to surround yourself with happiness. They tell stories, and make you feel like the space is yours. I once read about how kids need to see those visual reminders that they belong. They need to see the out-of-date wedding pictures of their parents, because it gives history and a feeling of security and permanence. Children need to see their baby pictures, because it helps them see where they’ve come from, and to feel like they belong. They need to see family pictures so that year after year, they have a visual reminder of how this group of people keeps growing and changing…together. And maybe children aren’t the only ones who need those visual reminders…. Those pictures on our walls are little pieces of this life we are building. When I arrived home from Boston, I realized there were no pictures on my mantel. I set down my suitcase and walked into the living room and looked across to the fireplace, and it felt empty. Empty of real stories. I went to my bedroom where the bed was made, and on my desk there were no pictures in frames and on the end tables there were no pictures. There was a framed picture of Yankee Stadium above the toilet in the bathroom, and there was some art I’d picked up in my travels, but there was little evidence of an actual character living an actual life. My home felt like a stage on which props had been set for a face story rather than a place where a person lived an actual human narrative. It’s an odd feeling to be awakened from a life of fantasy. You stand there looking at a bare mantel and the house gets an eerie feel, as though it were haunted by a kind of nothingness, an absence of something that could have been, an absence of people who could have been living here, interacting with me, forcing me out of my daydreams. I stood for a while and heard the voices of children who didn’t exist and felt the tender touch of a wife who wanted me to listen to her. I felt, at once, the absent glory of a life that could have been. Every single day, I live this life filled with hugs and running feet and sticky, chubby hands. I sit on the couch in the quiet evenings drinking tea and talking with my wonderful husband. We have loads and loads of memories, and all these ideas and dreams for the future. All of this happiness actually exists for me. I love the idea of having “evidence” of a full life being lived. That first morning when the girls woke up to our newly hung pictures, I saw exactly what I’d hoped to see. They looked and looked at those pictures, and they remembered. They talked about the different places the pictures had been taken, and I could actually see the way in which those pictures affected them. Now this is home. They see it, there is evidence for them in a way they can easily understand. And I can sit here, looking at each photo, and I can still feel what it felt like to be in each of those places, each of those memories. I look at my life, not just what is right in front of me today, but also what has been. It has been so good. I want to be reminded to remember. Make it happen. Get stuff up on your walls. Pinterest is your best friend, if you feel a little lost when it comes to hanging pictures in a good arrangement. Go type in “photo gallery” and lose yourself in Pinterest for a little while. Stop thinking about it as “decorating”, and start thinking about it as feeding your soul. Soul-feeding is far more important than having a perfectly decorated house. Go buy yourself the velcro strips at Michael’s, made specifically for saving your sanity in situations like these, and for hanging pictures without leaving any nail marks. 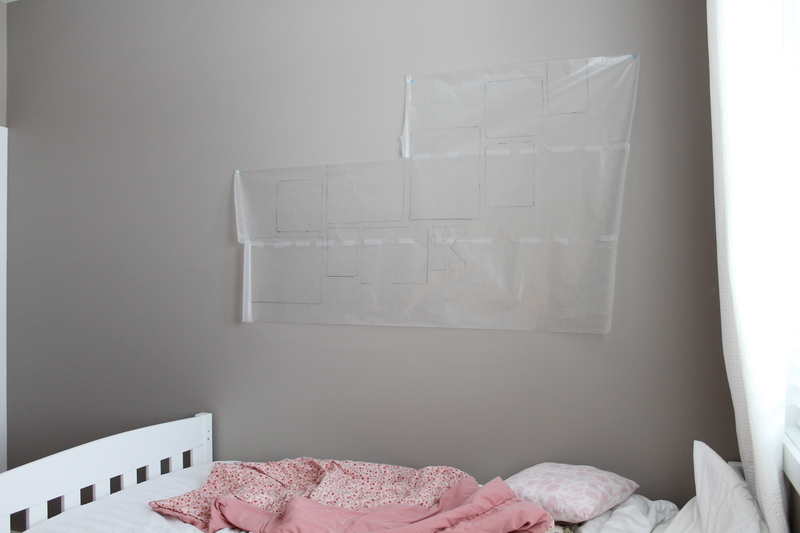 Check out this tip for making picture-hanging about 10 times easier. Get it DONE, and then come back to leave a comment, letting us all know about your picture-hanging success!! Live happily ever after, basking daily in the glow of all those warm memories, your own personal evidence of a life full of goodness, beauty and love.